헤어 토탈 브랜드 미쟝센 프로페셔널 라인은 6가지로, 헤어 고민에 따라 “페펙트 리페어, 데미지 케어, 안티에이징, 샤이닝, 스칼프, 쿨링 케어”로 구분됩니다. 이번 디자인 AD(advance)를 통해 미쟝센의 헤어 고민별 맞춤 전략은 기능과 연관성을 가지는 세가지 요소(컬러, 타이포그라피, 기호)를 디자인에 적용함으로써 훨씬 더 명확해졌습니다. 컬러는 경험을 통해 그 컬러가 가진 감각을 되살아나게 하고, 우리의 기분까지 좌우하는 중요한 요소입니다. 미쟝센 프로페셔널 라인은 이전에 미쟝센의 컬러풀한 감성을 유지하면서 기능을 가장 잘 대변하는 컬러로 6개의 라인별 컬러를 재정비 했습니다.컬러뿐만 아니라 제품 전면에 데미지 케어 (Damage Care)를 비롯한 6개의 라인명을 큼직한 타이포그라피(typography)로 표현하여 라인간 기능을 명확히 함과 동시에 마트에서의 소비자의 선택을 쉽게 유도할 수 있도록 디자인하였습니다. 또한 라인별로 적용된 6개의 기하학적 기호들은 각 라인의 기능을 형상화하기 위해 사용되었습니다. ‘무한, 완벽, 영원, 회복’ 등의 의미가 있는 원은 데미지 케어와 퍼펙트 리페어 라인에 사용되었고, 안티에이징의 경우 ‘균형, 상승’의 의미가 있는 삼각형이 사용되었습니다. 샤이닝케어의 경우 ‘정화, 보존, 유지’를 뜻하는 육각형을, 스칼프케어의 경우 저자극을 소구하고 있는 만큼 ‘신뢰, 정직’을 뜻하는 사각형을 사용하였습니다. 쿨링케어는 ‘미지의 에너지, 좋은 기운’을 뜻하는 별 모양으로 시원함과 긍정적 감성을 형상화 하여 적용하였습니다. 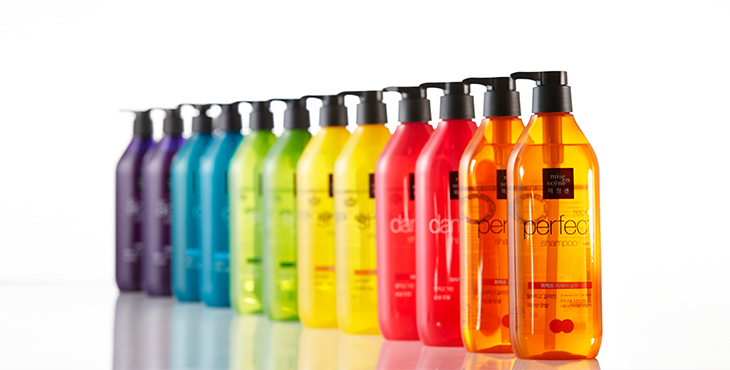 The premier hair products line, Mise en Scène Professional Line, is divided into six types--Perfect Repair, Damage Care, Anti-aging, Shining, Scalp, and Cooling Care--according to the hair problem. 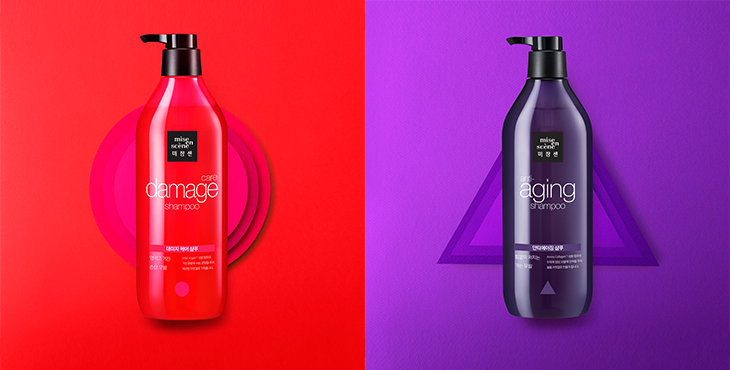 With this Design AD (advance), Mise en Scène’s customized strategy per hair trouble has become clearer by applying three factors (color, typography, and symbol) that relate the functions to the design. Color is an important factor that derives meaning from experience and even affects our feelings. Mise en Scène Professional Line retains Mise en Scène’s previous colorful sensitivity and reorganizes six colors per line that represent the product’s functions. Besides color, the names of the six Lines, which include Damage Care, are shown on the front of the products in large type so that the functions of each line can be clarified and customers can easily choose the product they need. Also, six geometric symbols are used per line to denote each line’s function. A circle, for ‘infinity, perfection, eternity, and recovery,’ is used for the Damage Care and Perfect Repair line. 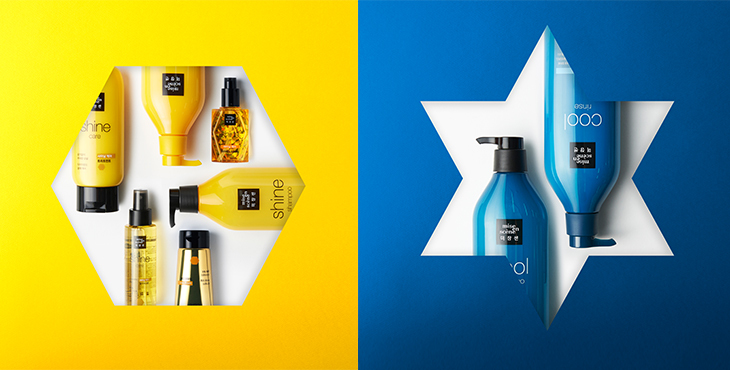 The Anti-aging line uses a triangle for ‘balance and rise;’ the Shining Care line, a hexagon for ‘purification, preservation, and maintenance;’ the Scalp Care line, being hypoallergenic, a rectangle for ‘trust and honesty;’ and the Cooling Care line, a star for ‘unknown energy and good energy’ by embodying coolness and positive sentiments.